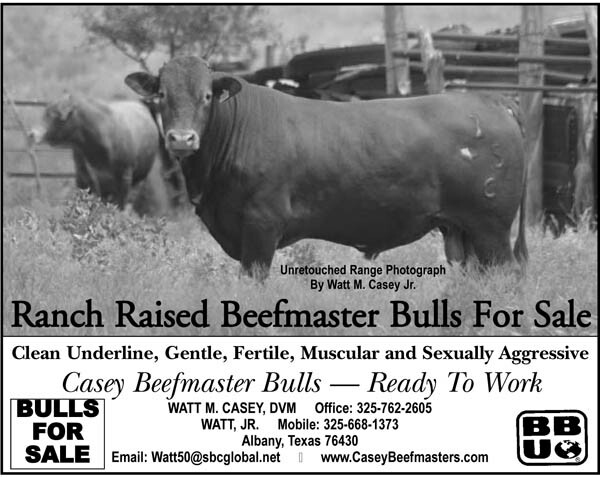 Casey Beefmasters is owned and operated by Watt Matthews Casey, D.V.M., his wife, Dosia, and their four children. When Watt graduated from Texas A&M with a Doctor of Veterinary Medicine degree in 1943, he was already in the army. Watt spent 3 1/2 years in the army, much of it as a paratrooper in the 11th Airborne Division before returning to civilian life. He practiced veterinary medicine and worked as a cowboy until the fall of 1947 when he added cattle ranching to his endeavors. 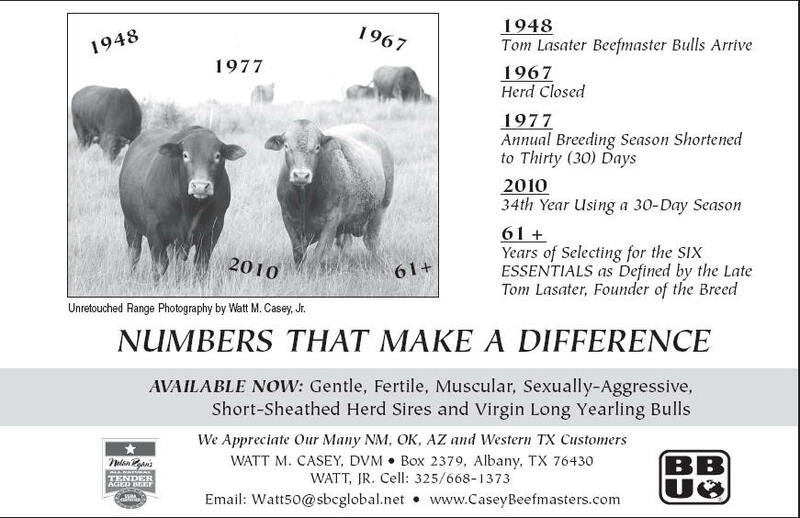 During the fall of 1948 Watt began using Lasater Beefmasters bulls and soon acquired Lasater Beefmaster females. 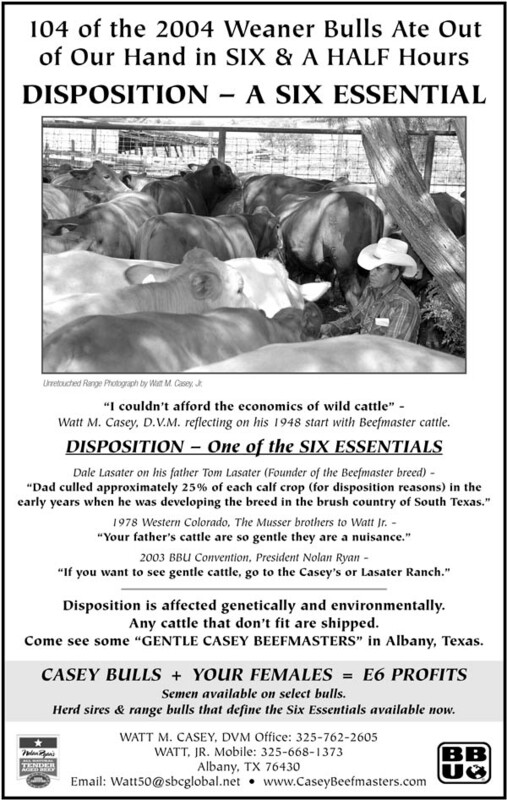 Beefmasters have performed well for the Caseys in three very different areas: Albany and Laredo, Texas and Kiowa, Colorado. 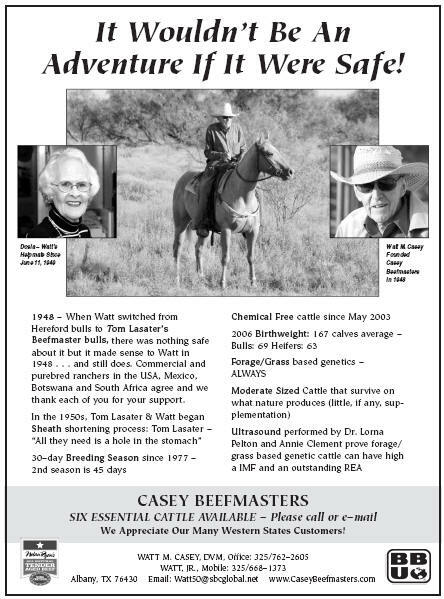 Since 1948 Casey Beefmasters has become one of the top sources of Beefmaster genetics. 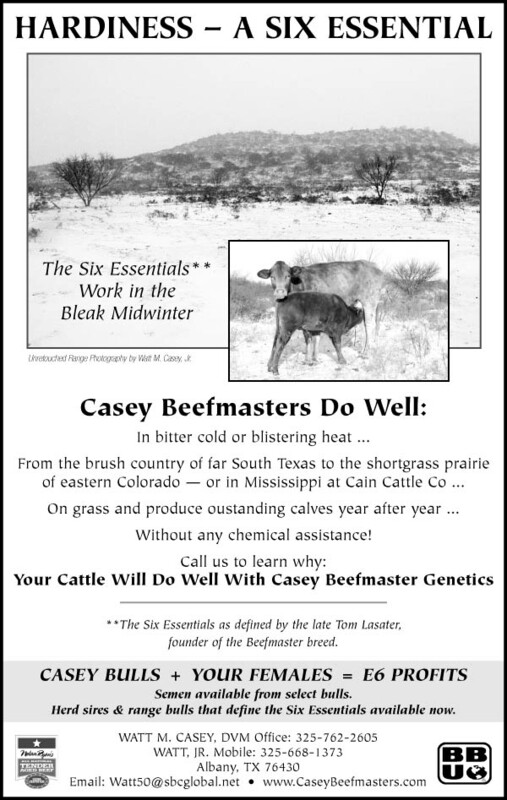 Commercial and purebred cattlemen from the Atlantic to the Pacific from the Canadian border to the Mexican border and numerous countries have purchased Casey Beefmasters genetics and cattle. 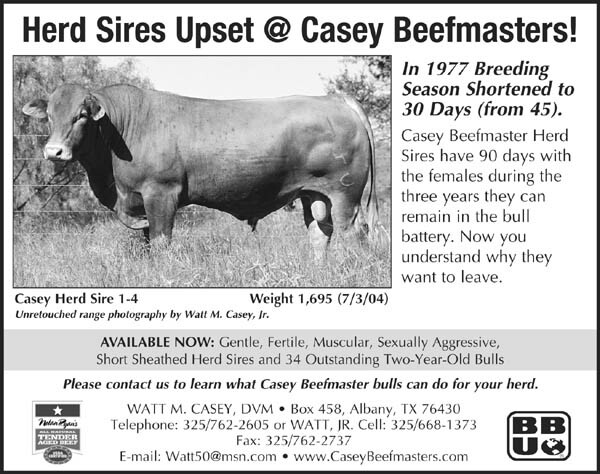 Many years ago Watt sold the first Beefmasters in Mexico and Africa. 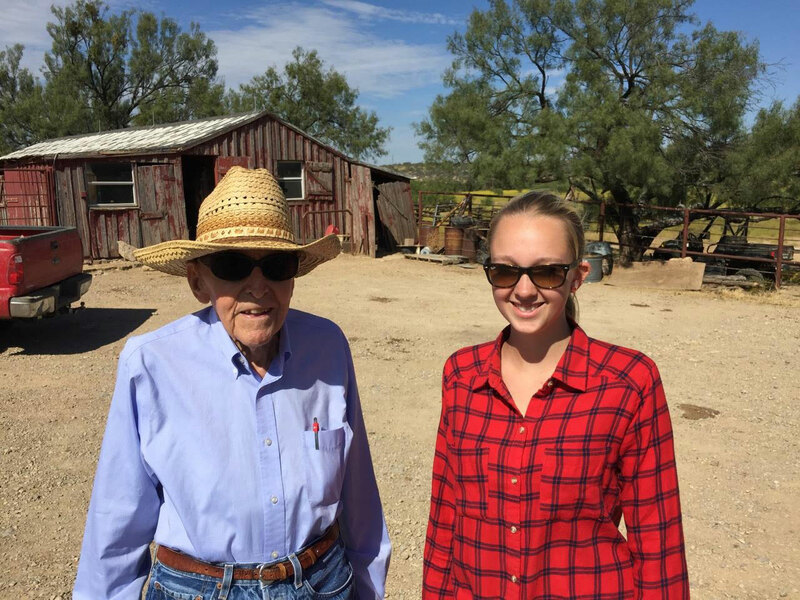 Watt and Dosia Smith married in 1949 and the oldest son, Watt Jr., is actively involved in the ranching operation. Watt was present at the organizational meeting for Beefmaster Breeders Universal. 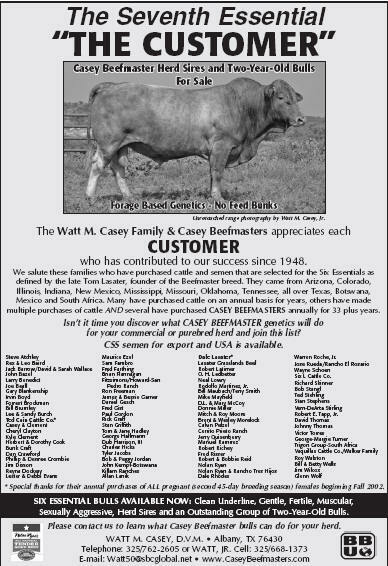 In addition, Watt and Dosia were charter members of Beefmaster Breeders Universal, charter members of Foundation Beefmaster Association and are charter members of Beefmaster Breeders United, which resulted from the merger of the two previous organizations. 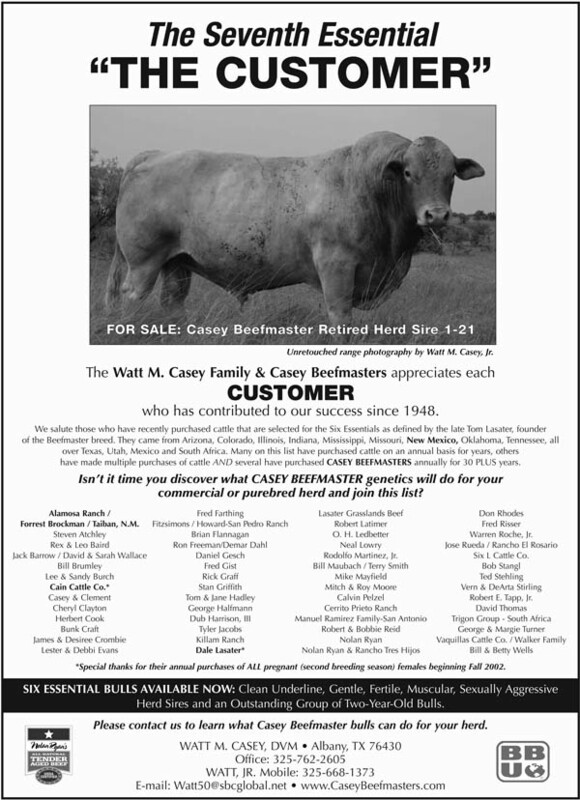 Watt has served on numerous committees and as a director several times in Beefmaster Breeders Universal and Foundation Beefmaster Association. To find out more about BBU, click here. Watt is a member of the Beefmaster Hall of Fame. He is one of eleven who have received the highest honor the Beefmaster organization bestows. Watt and Dosia were recognized as a "Legend of the Breed" at the Legacy Award Dinner in San Antonio on October 24, 2002, along with seven other families. 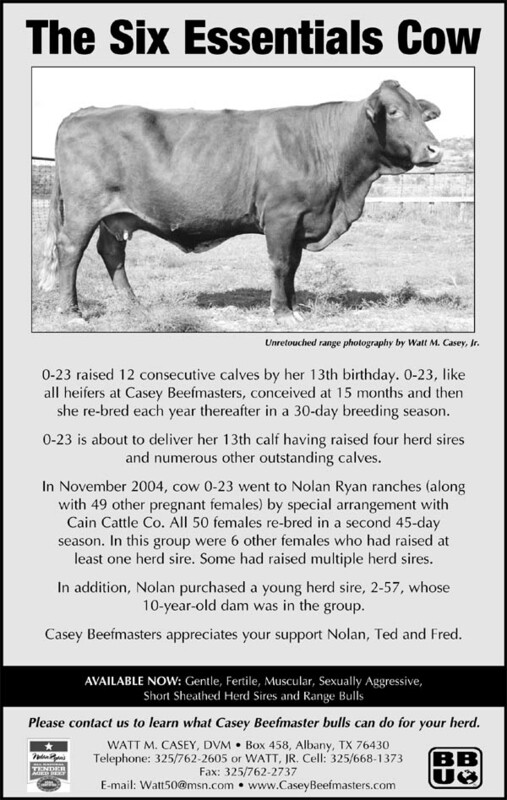 This honor was BBU President Nolan Ryan's idea and was presented to those families who have raised Beefmasters for 50 years or longer. 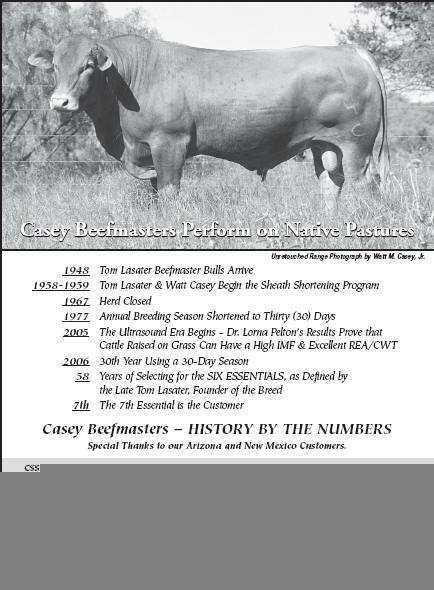 BBU and Casey Beefmasters hosted a successful field day on June 14, 2003, with over 130 people from Arizona, Colorado, Mississippi, New Mexico, and Texas attending. After viewing several groups of cattle, the group returned to the headquarters to eat a meal prepared by Bill Cauble and his Western Wagon crew. Following the lunch, the group adjourned to hear talks by Dr. Jim Sanders, meat specialist at Texas A&M; Charlie Bradbury, former CEO of Nolan Ryan Beef; and BBU Executive Vice President Wendell Schronk. The Phin Reynolds Ranch is the home of Casey Beefmasters and is located one mile north of Albany, Texas. Albany is 120 miles west of Fort Worth and 35 miles northeast of Abilene. To learn more about Albany, Texas, click here. Since 1948 our cattle have been bred for the SIX ESSENTIALS as defined by Watt's brother-in-law, Tom Lasater, who founded the Beefmaster breed. We believe Tom Lasater was correct when he selected the SIX ESSENTIALS which are: Disposition, Fertility, Weight, Conformation, Hardiness and Milk Production. The 2015 bulls IMF averaged 3.67 and REA 8.81, the heifers IMF 4.64 and REA 7.99. The 2014 bulls IMF averaged 3.64 and REA 8.74 the 2014 Heifers IMF averaged 4.28 and REA 7.92. The 2013 bulls IMF averaged 3.37 and REA 9.60 & the 2013 heifers IMF averaged 4.31 & REA 8.70. 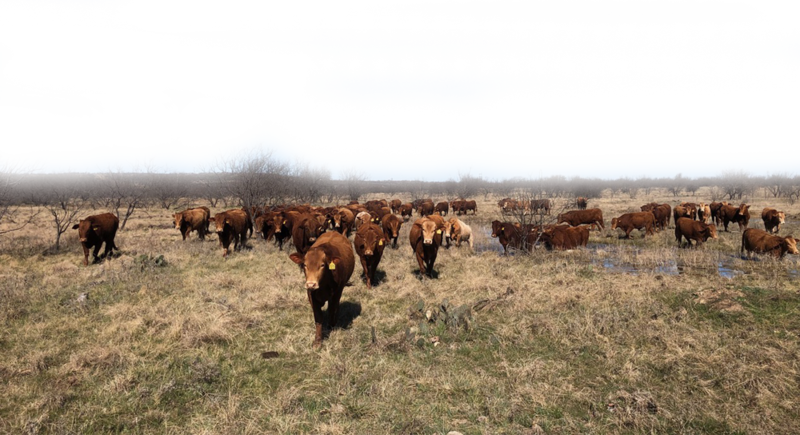 Our yearlings achieve this during droughts and wet years, on native grasses and forage without being puffed up with feed in other words they do this on their own. Casey Beefmaster cattle are in an environment much like that of area cattle. They basically live off the range with some supplemental feed as required by conditions and need. Since 1977 the breeding season for all females ages 14 months and older has been 25-30 days. Those that do not conceive during this breeding season are later exposed to our top herd sires for approximately 45-60 days and offered for sale when safe in calf. A very high percentage (in the upper 90s) conceive during the combined breeding seasons. In 2015 and 2016 83-84% of the cows were pregnant after a thirty day season. In 2014 we shortened the breeding season to 25 days for all females who had calved. 89% were pregnant in one of the driest years on record. The 2015 yearling heifers averaged 74% bred, the 2014 heifers 71% and the 2013 yearling heifers had 78% pregnant. 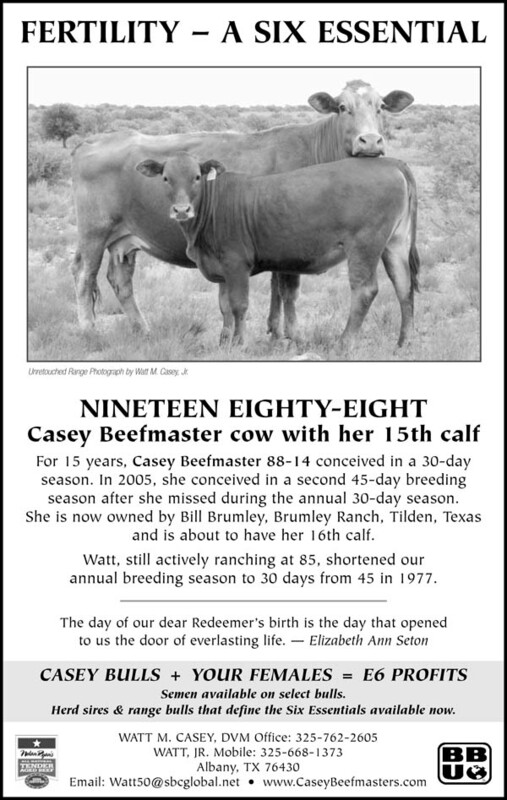 The Casey Beefmaster herd was closed in 1967. 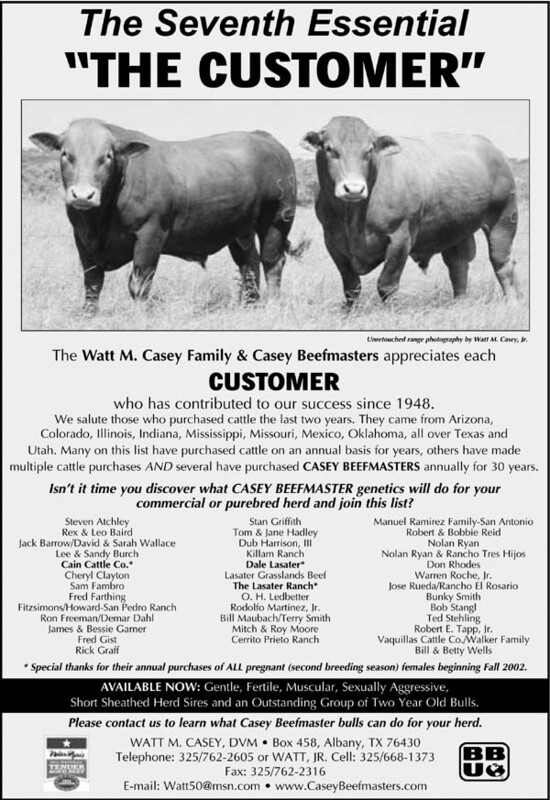 Our genetic base is the Lasater Ranch Foundation herd. 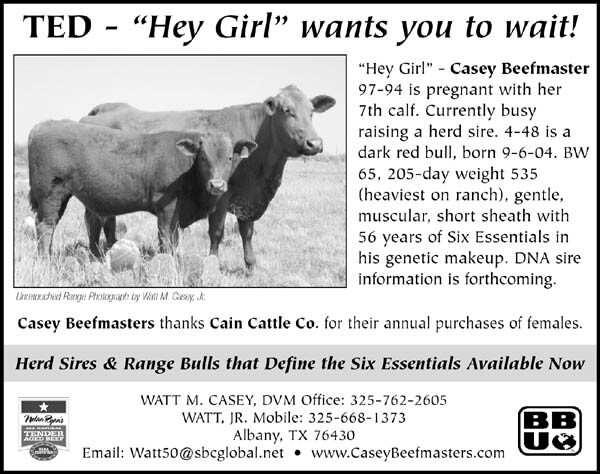 Casey Beefmasters are gentle and tractable. They are selected for disposition genetically and handled in a manner that enhances their naturally good dispositions. Tom Lasater, founder of the BEEFMASTER breed, was one of those rare individuals who knew from childhood what profession he was going to pursue. He was fond of saying that ranching is his avocation as well as his vocation. Tom Lasater's philosophies of cattle raising encompasses all aspects of the business from range ecology to merchandising. Perhaps his philosophy can be labeled "creative radicalism." A good manager must be in love with results. A sound breeding program, oriented toward results, should be based on the Five Commandments of Livestock Breeding. The First Commandment is to select only for the SIX ESSENTIALS: Disposition, Fertility, Weight, Conformation, Milk Production and Hardiness. The Second Commandment is to strive for reproductive efficiency. The Third Commandment is to performance test in a constant environment. The Fourth Commandment is to employ direct selection, which means selecting for the specific traits sought and not for a combination the breeder hopes will produce the desired results. The Fifth Commandment is to utilize the adaptive powers of nature. Tom Lasater's policy was to ask the impossible of nature. Watt and Janina From Hanover Germany. Janina Helped Us Move Cattle and Sort Bulls in October 2015.